Hey! 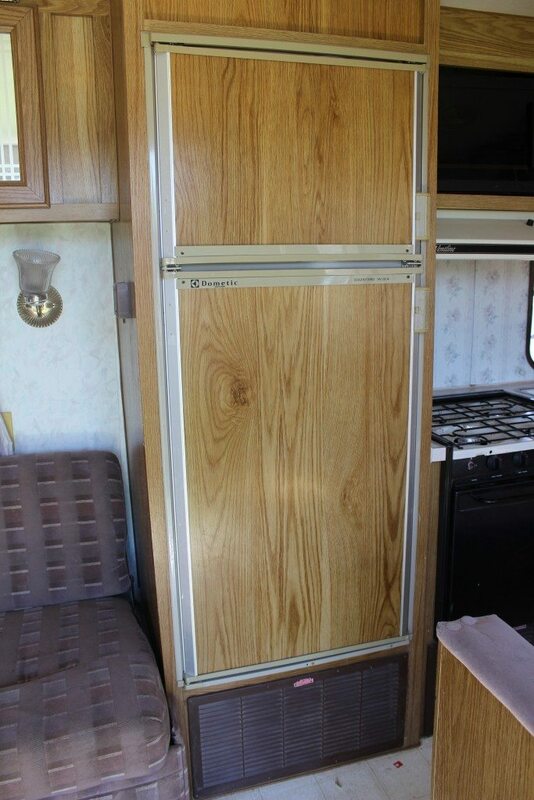 I am excited to share with you some more details about the travel trailer. Let start from the VERY beginning. The first thing I started with on the trailer was write down every project that I planned on doing and then addressed it in order that it needed to happen. After I wrote everything down I realized that this was going to be a very big undertaking. 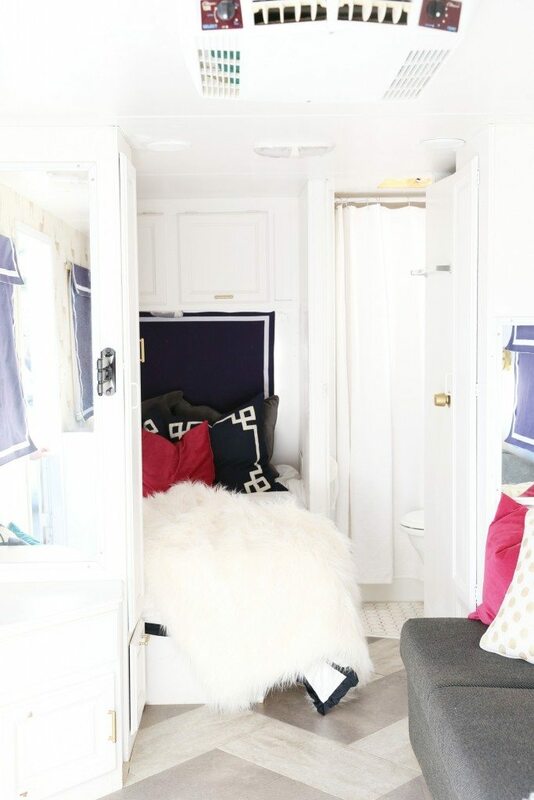 Number one on my list was to paint the inside of trailer. 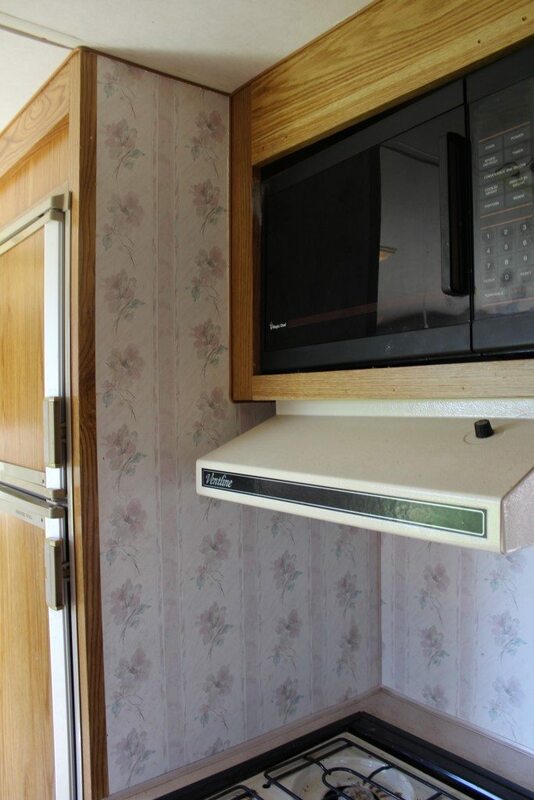 Our trailer along with a million other trailers have the WORST wallpaper and couch cushions etc. Why do the wallpapers have to be so ugly?!?! I honestly don’t even understand it! Anyways, it all had to go. Then after we addressed the fact that the wallpaper was awful and that all the trim pieces needed to be painted we took out the carpet and it was so nasty and a hot mess. 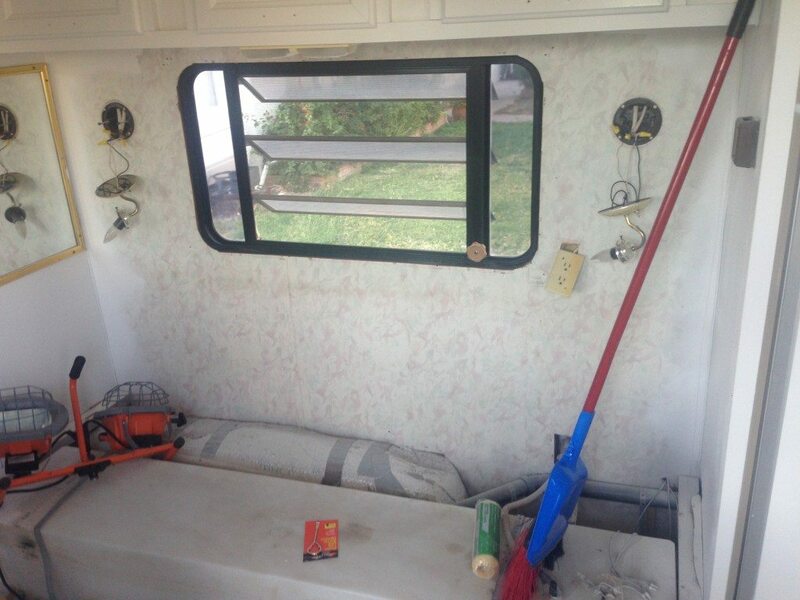 We know the previous owners of the trailer and they were VERY clean people and they kept the trailer in great shape but after years of the dirt and everything things just get crazy. 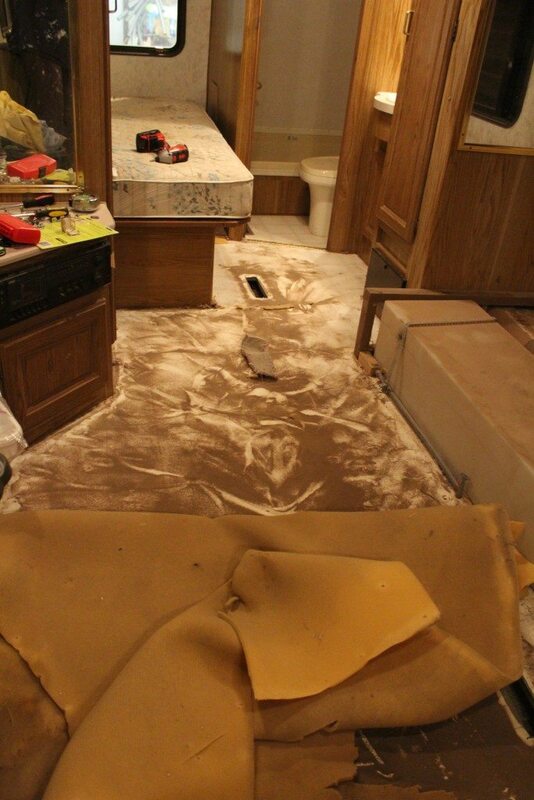 When we tore up the carpet this is what we found…. This really fine dust and dirt. I mean I will be totally 100% real with you, I made my husband do this part. I started to help him and after coughing like a crazy person I just went inside my house. My husband is a very good man and took one for the team and ripped it all out and cleaned everything around it with a shop vac. We removed the couch and cleaned under there at the same time. We took out all the cushions and the couch and anything else that did not need to paint and the put it all in the garage to address at a later time. Then we addressed the walls and the cabinets and the ceiling. 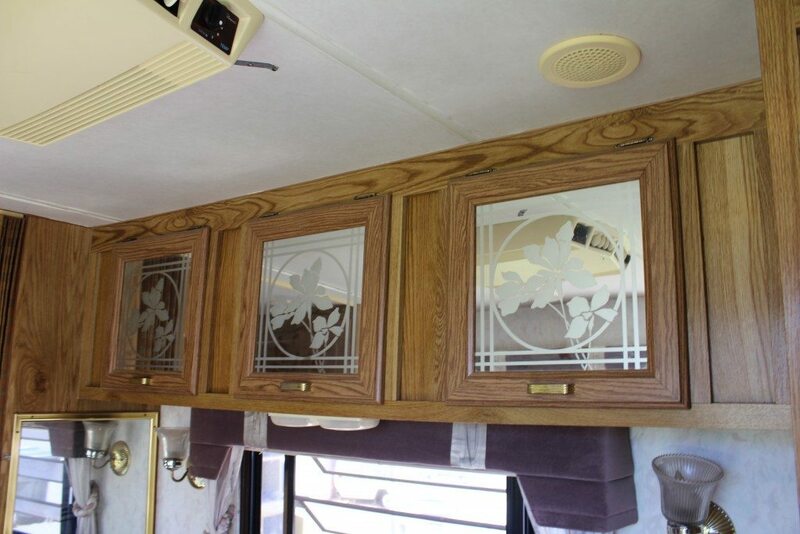 I was a little bit unsure what I wanted to do about the mirrored cabinet fronts. My first thought was to remove the mirror part and replace it with just normal wood then paint it white with the rest of the cabinet, but then I figured why when replace them when I can just paint over them and that is exactly what I ended up doing. I painted right over the mirror. I am seriously the worst because through the trial and error part of trying to figure out the best method I failed and I did n0t take any pictures! I am sooooo mad at myself!!!! I am so sorry. I will do my best to describe what I did. 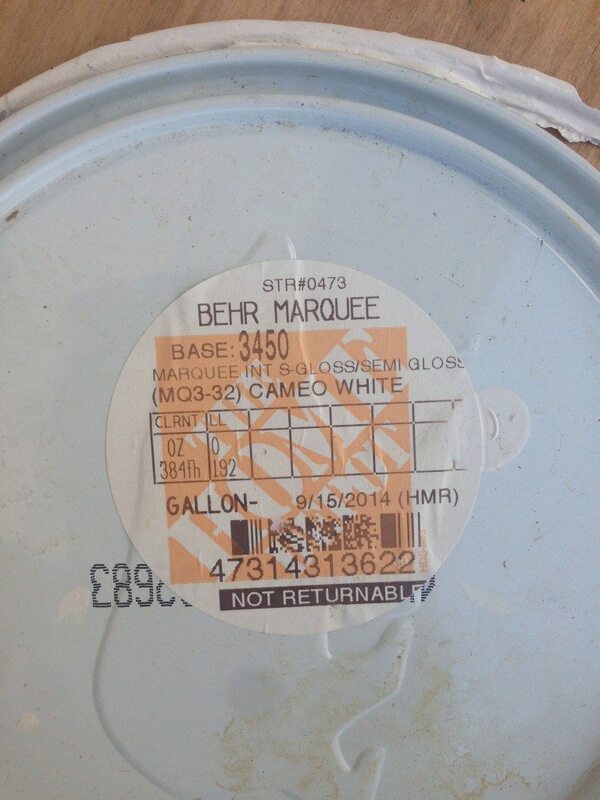 The paint color I used was the Cameo White in Behr Marquee. I used a semi-gloss, I like to use semi-gloss on high traffic areas because you can wipe it down really easy. Before I started to spray everything I taped off a few things like the silver trim on the fridge and the oven and the windows. Then I took off the trim pieces on the window and put them in the garage to spray paint later. Then using the Home Right paint sprayer I sprayed everything!!! And I mean everything. If you notice the ceiling in the picture above it was peeling off I thought I was going to have to peel off everything on the ceiling but instead I just buffed around the peeling part with a softer/low grit sandpaper and I just sprayed right over the top of it. To top that off I also sprayed right over the top of wallpaper! Can you even believe that!?!??! I thought for sure that I would need to remove the wallpaper but no I did not. 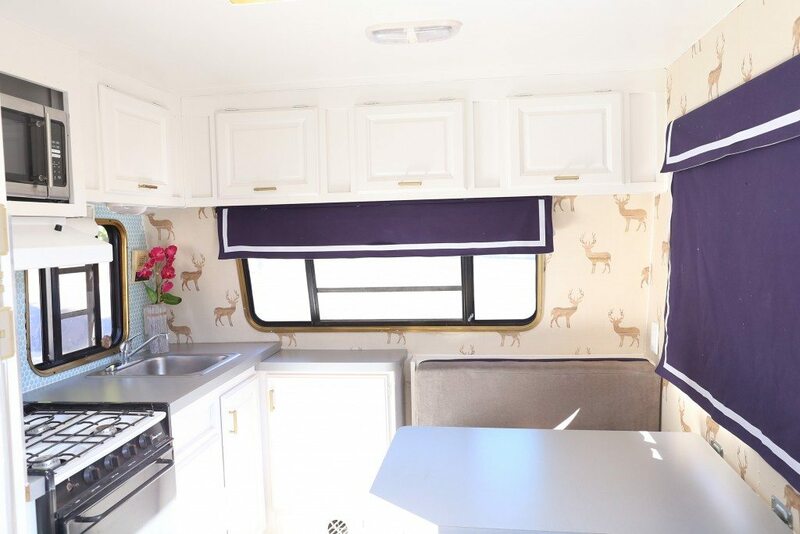 If it was in a house of coarse I would remove the wallpaper first but because it is in a trailer there are some trim around the wallpaper and if I was to remove the wallpaper and then the trim would need to come off and it would be a nightmare to put the trim back on. 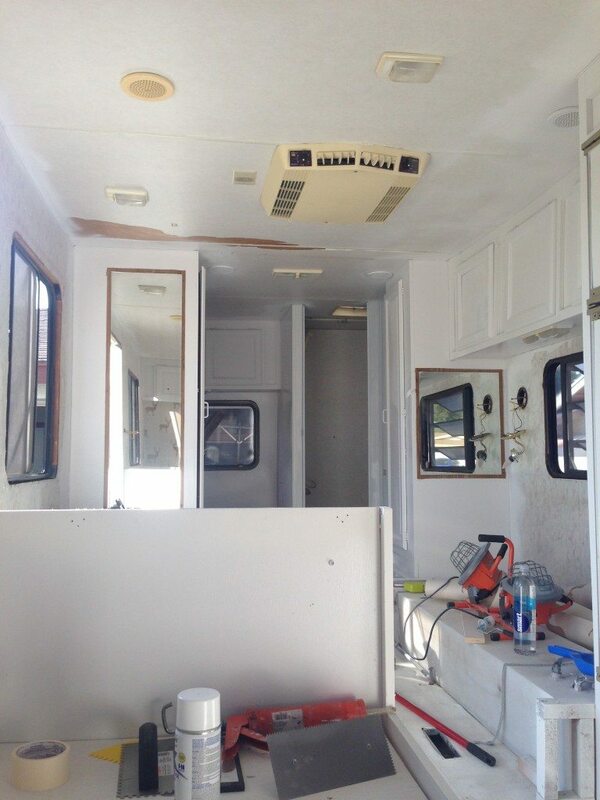 If you notice in the picture above I went around the whole trailer and I used spray paint Kilz primer on the plastic trim before I sprayed the trailer with the spray gun. 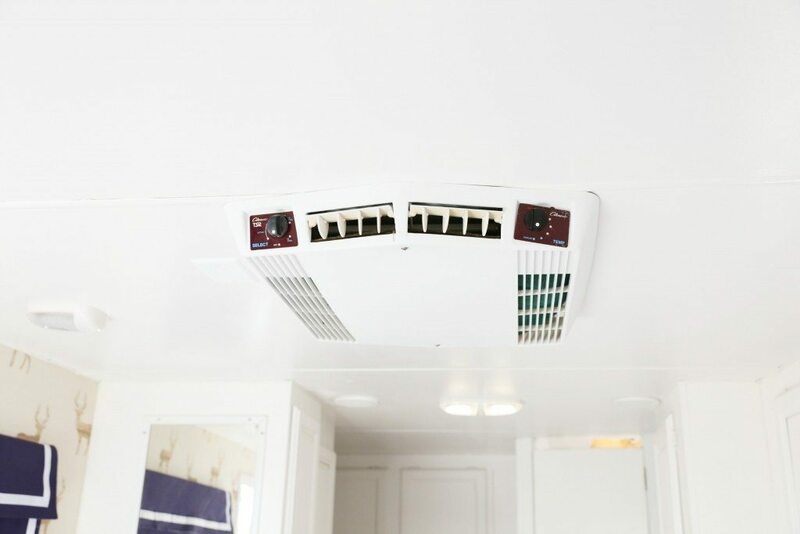 I sprayed the fridge, the ceiling, right over the wallpaper, right over the mirror, over the air vents and even right over the ugly AC unit on the ceiling. Pretty much I just painted all the things! Paint makes the BIGGEST difference! It totally transformed the trailer. I was soooo overwhelmed with the thought of having to do the paint job and it was way easier then I thought it would be. 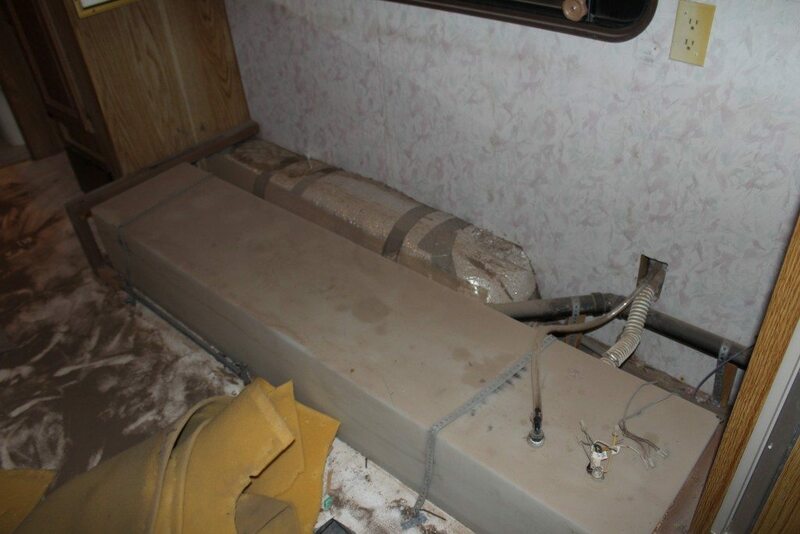 Here is picture of the Outside of the trailer. Happy to see such hard-work which had been done by girls. Really nice article. How did you deal with the sofa? Did you recover yourself? 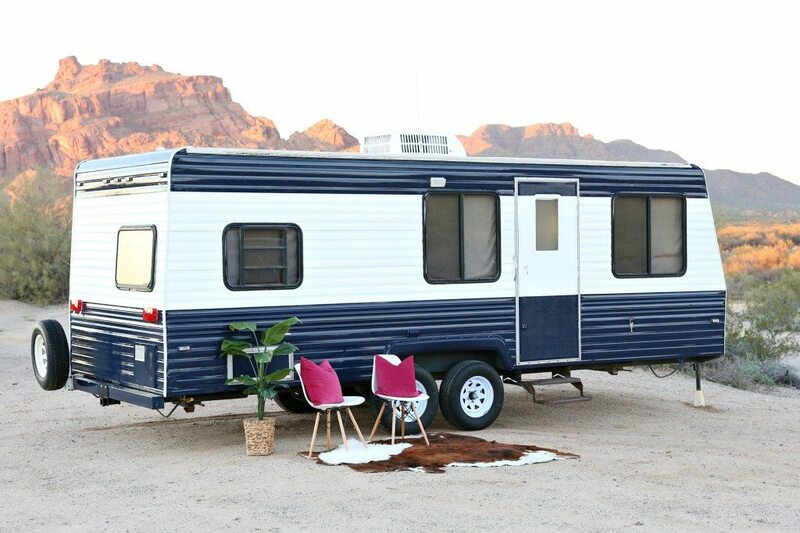 I’ve always wanted to find & redo a trailer. Yours turned out so amazing! Love all the color choices too! I’m dying to know about your tile backsplash…is it really glass or vinyl? Thank you! It is ceramic penny tile! 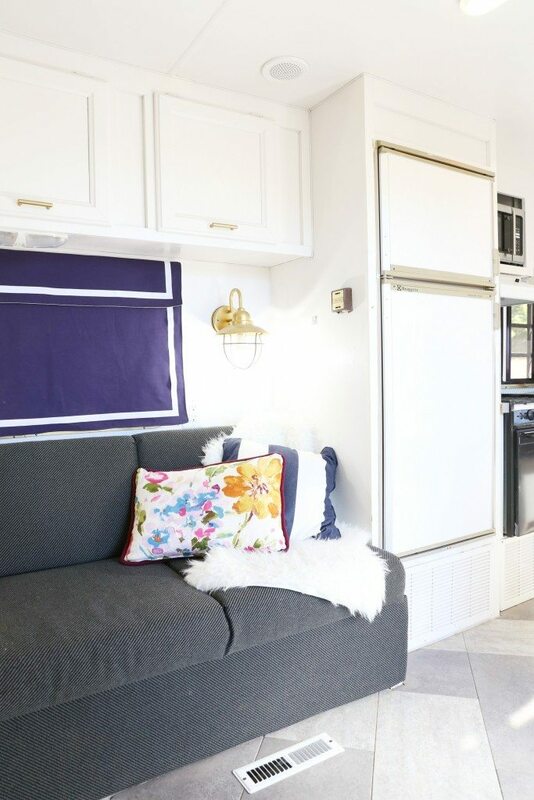 Love your renovated camper! Where did you get the wallpaper? I have the same trailer I’m remodeling right now. Any advice on recovering the couch? Thanks! Hi Kinsey! There are a lot of reupholstery tutorials on YouTube but we hired someone to do ours since we had so much other work to do on the trailer. Thanks! Ohhh my goodness I’m in love 😍 I hope mine turns out half as good as yours! 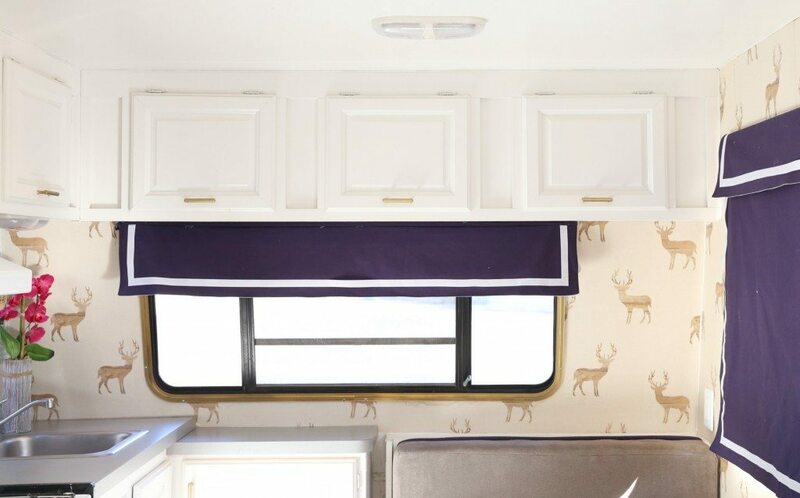 Where did you get the seer wallpaper/decals? I want to use it on a feature wall in my trailer! 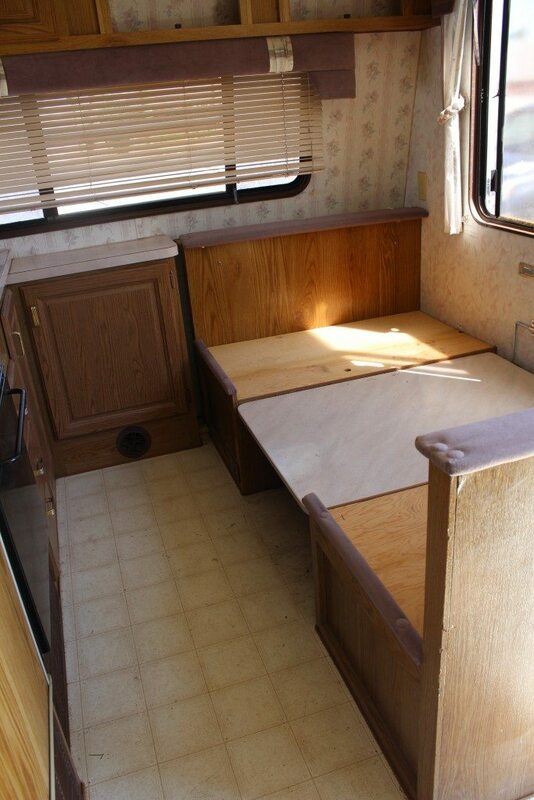 What model of camper is this? 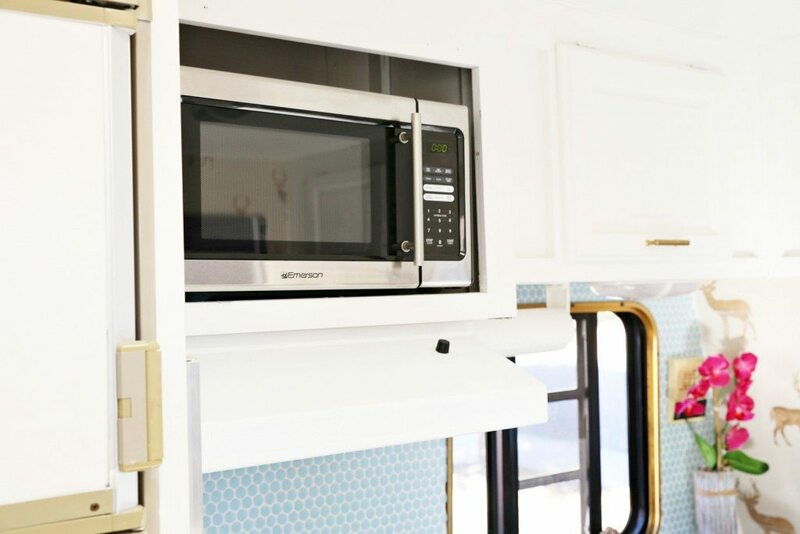 Do you have a link to the blue subway tile wallpaper in your kitchen area? I assume you taped off faucets etc, but did you also spray over the counter? Your camper looks AWESOME! 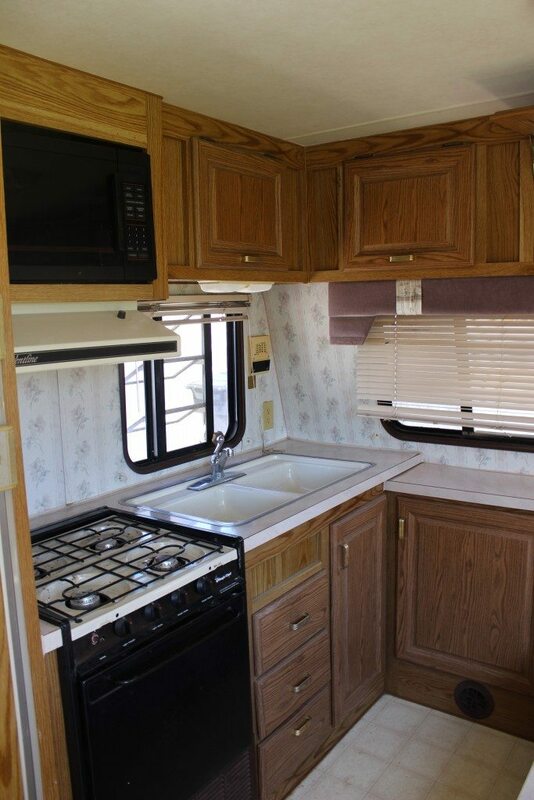 We have a 1996 Terry we are remodeling for hunting and family outings. How did you overcome the floor height difference when you removed the carpet, but left the old tile? Doing this by myself so any suggestions would be helpful. Also can a tub/shower combo be replaced with just a shower stall? I absolutely love your remodel! for you bathroom did you move the old floor tile before putting the new tile down or your just put the new tile on top? My camper is similar to your so this gave me great motivation! I will be remodeling a 1997 Prowler this spring. We have the same ugly mirror doors. Did you remove the decals on the mirrors before painting and if so, how did you remove them?